The Way I See It: Paper or Plastic? I went outside this a.m. to scout around the property before heading off to work and found these paper whites had pushed through the frozen hard earth. 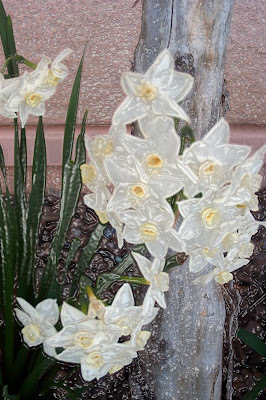 I used the plastic wrap filter in PS to alter the image which you see here below the original. It's reflects how I think these delicate flowers should look in 28 degree temperatures but as a matter of fact it's the cold snap that helped these fragrant flowers along. 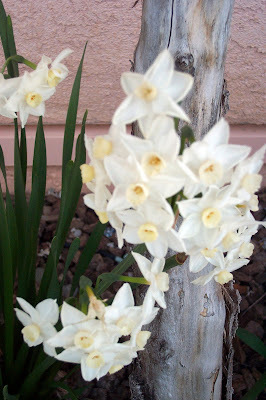 I found these in the wild behind our house a couple of years ago and pulled up some bulbs and replanted around the house. These little gems come back every year after the cold snap. Here's to Spring in the horizon or your step whichever comes first!
" Worry takes just as much time as work and pays less"
Thanks for your visits! My other blog: ThE ArTfuL EyE"
In this case...plastic!! Neat-o effect!! When do you have time to do all this??? You've really got an ArTful eye!!! Beautiful! I love paper whites! These photos are beautiful. I like this right after your other post with the desert flower. You are inspiring my next flower series, which I have been brain storming over for a while. Thank you! Beauty wins over the onslaught of nature every time and worrying should be limited to a set number of minutes a day and then no more of that.